The Bertrand Chaffee Hospital lobby sees a cast of constantly changing characters. 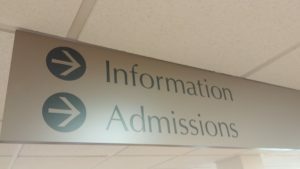 Family members sit with snacks from the coffee shop, employees pass through, and patients wait for their turn to check in with one of the most visible parts of hospital administration: the Registration Department. The registration desk at Bertrand Chaffee Hospital is the first department many patients encounter when visiting our facility. From a steady stream of patients to constant phone calls, the BCH registration desk manages a flurry of activity from seven in the morning until seven at night. Periods of intensity – a full waiting room, phones ringing non-stop, and patients streaming in – are punctuated by an occasional lull. And each registration visit is completely different. On a busy day, the team might register 160 people – and there are many busy days. Countless more patients and community members come in with questions and information requests. “There’s no such thing as a typical day here,” said Maryann Vanderkarr, registration department manager. Vanderkarr heads a 10-person team that registers patients for lab work, imaging tests, emergency care, inpatient stays and surgical procedures. She has been with BCH for about four years, two of them as a manager. 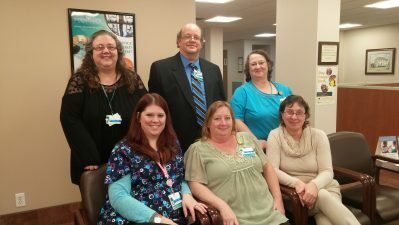 As the clerks work with patients and family members, they also coordinate with provider offices, medical records, billing and insurance companies to make sure the information is up-to-date. It takes accuracy, a strong sense of customer service, and a willingness to be flexible to be a hospital registration clerk. “We do everything we can to make our patients’ time in registration as easy, quick and painless as possible,” Vanderkarr shared.